Noida is emerging as one of the most promising locations attracting a number of homebuyers. The city has witnessed huge growth and demand for housing options due to the strategic location and easy connectivity. Easy accessibility to Delhi NCR has made Noida a most sought-after destination to invest. The biggest advantage is the difference of capital values of the properties as compared to Gurgaon and Delhi. Due to this, the demand for residential properties is increasing in the city. 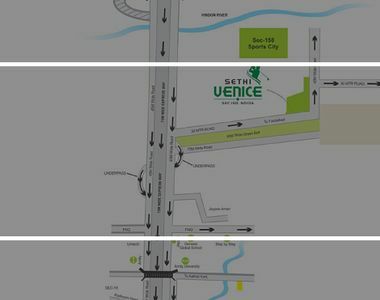 Sethi Venice is an amazing housing option designed for the homebuyers looking for quality homes in Noida. Being located in Sector 150 Noida, the project is attracting a number of investors from various parts of the country. Well, sector 150 Noida is witnessing huge infrastructural developments and has become the most preferred destination to reside. Noida Authority has already declared Sector 150 as one of the greenest sectors in the city and attracting a number of homebuyers and developers. Situated at a prime location near Noida Expressway, the complex is easily accessible from all the corners of Delhi and NCR. This is an ultimate location to live a dream life comfortably with your lovable family. A number of blue-chip companies have also come up at this location and besides this, the educational and healthcare infrastructure is also well-developed. A few years back, people use to buy homes depending on location, architectural style, design and the plan. But one of the most popularly known features among modern homebuyers is green or eco-friendly homes. The rapid increase in the temperature has aroused the people demining an instant solution for the conservation of the environment. This is when the concept of green living was raised by the developers. Now, top developers are coming up with the projects promoting green living and focusing on more open spaces and landscaped gardens. Looking for sophisticated homes in Noida offering all the green living facilities, Sethi Venice Sector 150 is the best option. The apartments at Sethi Venice are available in 3 and 4 BHK housing options and loaded with all kinds of fitness and lifestyle amenities. The spacious and comfortable rooms have a stunning floor plan with large windows and balconies that are sure to overwhelm you with the green surroundings. The quick access to Noida Expressway offers easy navigation of the residents from one location to another in the city. The complex is surrounded by all the green living facilities and open green gardens to offer you an ideal abode to live up to your housing dreams. So, what are you waiting? Have a look at the complex and make a wise decision to invest.